Pakistan Announces The World Will Adhere To Muslim Blasphemy Law – I Am Not Ashamed Of The Gospel Of Christ! I couldn’t believe my eyes. Dawn News from Pakistan is reporting that the Interior Ministry has launched a global campaign to force the free world to follow Sharia blasphemy laws. That’s right they did just that. They are hiring international lawyers demanding facebook and other social media sites in the US hand over user information to them. They said they are appointing a liason to our FBI. To investigate social media sites here on a daily basis. They said they will take all measures required if these platforms don’t comply. My God how far will the West allow this to go? Is it any wonder that Pakistan is on President Trump’s travel ban? And really? Use our FBI in this country to enforce the barbaric blasphemy law?? Athiests, liberals, the ACLU and satanists daily Blaspheme Christ and Christians here. But the blasphemy law in Muslim countries call for death. In fact the Koran itself calls for this. Quran (6:93) – “Who can be more wicked than one who invent a lie against Allah?” If the death penalty is prescribed for lesser crime, then it stands to reason that it should be imposed for the most “wicked”. Quran (33:61) – [continues from above] “Accursed, they will be seized wherever found and slain with a (fierce) slaughter. So now we will force the world to bow to Sharia law? According to a definition from wikipedia this declaration should be declared a crime under international law. 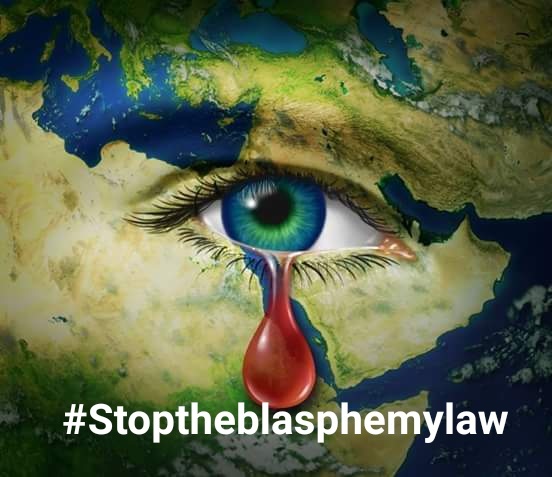 Blasphemy laws that systematically target an identifiable section of the community with severe penalties that may include imprisonment or death are genocide or crimes against humanity. Those who enact or enforce such laws are liable for prosecution for genocide or crimes against humanity in the International Criminal Court or by specially convened international tribunals. See Article 6 Genocide and Article 7 Crimes against humanity 1. of the Rome Statute. Pakistan blasphemy law carries the death penalty. Many have been executed and many murdered and slaughtered under this law. Asia Bibi awaits her death sentence for blasphemy as she refused to denounce Christ. She was charged several years ago with blasphemy simply for drinking water from a Muslim well. A Governor of Pakistan was assassinated because he spoke out for her and against this barbaric demonic law. Now they are demanding the world conform to this beast. All aid should stop, and these countries, Pakistan, Iran and yes even Saudi Arabia should be tried for crimes against humanity. This is no better than what ISIS is doing. And the UNHCR still refuses to recognize how this hurts Christians fleeing Pakistan. This beast is growing, and it’s goal is to control the world. Do you still doubt?